Sticking nicely to the well-known KDE Release Schedule, here are packages for the latest and greatest KDE Software Compilation. Principally, I am targeting Slackware-current with my bleeding-edge packages for KDE. However – as was the case with the previous KDE release, there is not all that much divergence between the stable release (Slackware 14.1) and the development tree (Slackware-current). That is why I built my packages for KDE 4.12.3, on Slackware 14.1 for maximum compatibility. They work fine on both platforms. What’s new in my KDE 4.12.3 packages? Apart from all-new versions for the core applications, I also updated the oxygen-gtk2 and plasma-nm (and libnm-qt, libmm-qt) packages. I was unable to compile the latest oxygen-gtk3 release because Slackware’s GTK+-3 package is too old. There is one interesting addition! There is a new package called kdeconnect-kde. 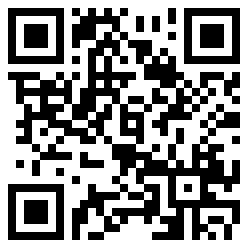 Together with the kdeconnect-android app for your smartphone or tablet (no iPhone, surely you don’t own one??) 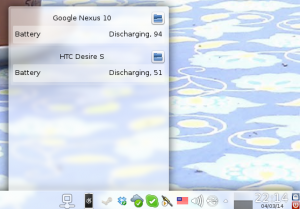 it “fuses” your KDE desktop with your mobile device. 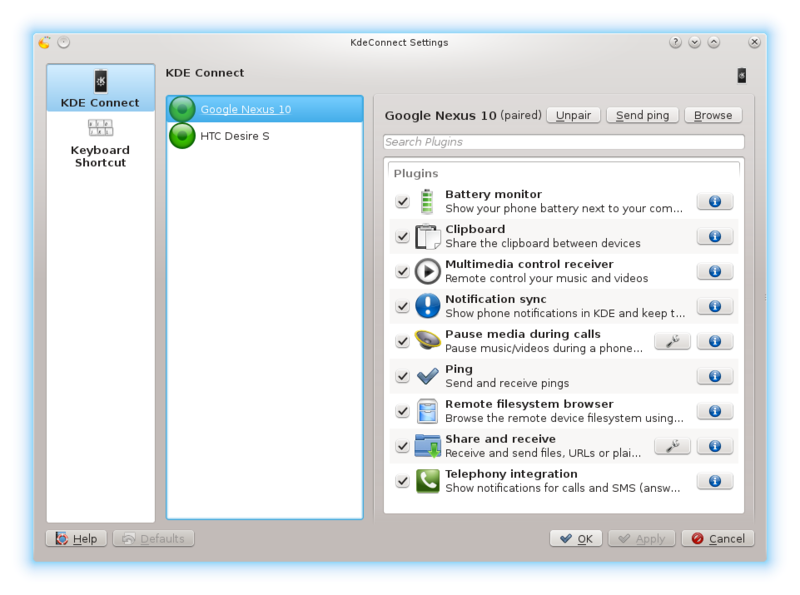 Prominent features of KDE Connect are: battery status display, clipboard share, notifications sync, multimedia remote control, and all of that over secured network connections. Don’t forget to add the new “KDE Connect” widget to your system tray. How to upgrade to KDE 4.12.3 ? Where to find packages for KDE 4.12.3 ? Download locations are listed below (you will find the sources in ./source/4.12.3/ and packages in /current/4.12.3/ subdirectories). Using a mirror is preferred because you get more bandwidth from a mirror and it’s friendlier to the owners of the master server! Posted: 4 March, 2014 in Slackware, Software. Hi Eric, thank you for the new release. Which package depends on LibRaw? I have LibRaw 0.16 installed and I would like to keep that, recompiling the kde packages against it, if it not ends up recompiling the whole suite 🙂 . LibRaw is used by libkdcraw. Perhaps a recompilation is not required, unless you encounter a real issue because of your newer LibRaw package. I will add an updated version of LibRaw to the future KDE 4.12.4.
thanks again for your packages. I also noticed that the new network management applet/widget got some updates — cool! Hi Eric, thank you for these updates! One question though, I see there’s no kwalllet package this time, has it been integrated into another package? You are right! The kwallet package was renamed to kwalletmanager in 4.12.3, how stupid is that! I will build a package for it today. Hi Eric, the 4.12.3 packages are under current. I do not see one under 14.1 tree. If I update them from current tree on my 14.1 machine, will it break any dependencies? Hi Bob, thank you very much for your work! I ‘ve a dubt that perhaps you can help me to resolve. Every time I try to compile, with your script, a version of KDE I always obtain a kdm file that won’t start. But using your pre-compiled version of kde-workspace, that is the package that contains it, I finally get kde to work. Why my compiled version is build differently from yours? Indeed, they are under ‘current’ because that is the Slackware release which I am targeting. However I have built these packages on Slackware 14.1 as a ‘courtesy service’ but you will not see them appear under ktown’s ‘14.1’ directory. If you want to use these packages in Slackware 14.1 you can do so without any concern for breaking stuff. I do not know your computer so I can make no educated guess about why you get a broken KDM when you compile it yourself. Do you actually download the complete source directory tree? I build my packages on a clean Slackware system with all the older KDE packages removed. The old kwallet seems to be working fine with the new KDE but I’ll upgrade when the new package arrives. Actually, I had issues with the ownCloud client which suddenly refused to use the login credentlals stored in Kwallet. After upgrading to kwalletmanager my ownCloud client logs itself in automatically again. The packages are available on taper.alienbase.nl and alien.slackbook.org now. The other mirrors will sync within a day. I would like to thank you. Your new ktown release with KDEConnect, besides telegram-cli released last night (local time) are the two most beautiful packages I’ve seen on Slackware lately! Our mobile lives are vastly improved from now on thanks to you and all those wonderful devs behind KDE, telegram and tg-cli. Thanks Eric for your reply. I compiled KDE from your complete source tree off the X environment, but I didn’t remove the old version before, just upgrade the packages already installed. All that using a Slackware current powered by an Intel I5 3550. I will retry this time without an installed version under the hood ok. I would like to thank you for this new release of KDE. It works fine on my laptop (KDE current with multilib). I am only having difficulties to find the KDE connect widget. Am I blind? I wold like to thank you for your work on our preferred distro. I’ve just installed this version of KDE (i usually keep all in current under my Slackware) going from 4.12.1 to 4.12.3 I’ve noticed that Dolphin became very slow on opening. WARNING: ‘workgroup’ and ‘netbios name’ must differ. May depend on what? The previous version worked perfectly. I’ve resolved from my own. On a Debian form I’ve found that the problem mostly is caused by some old KDE configuration files. After this, I’ve restarted KDE and the behavior is unchanged except for the virtual desktops, for which I had to reset it to the old number (I’ve six virtual desktops). Now Dolphin starts fast and the other software seems to work fair. Hello, Stephan. I can help you on KDE Connect widget matter, as I found myself lost on that one to for a few minutes before I remember how to get it done (it’s a very unusual task for me). To get it temporarily only, you can open a windowed application by hitting ALT+F2 to open ‘run command’ dialog, search for ‘connect’ and it will show up as the first result. For a permanent wiget in one of your panels, click on the little gold thing icon (what is that?!?) and choose ‘Add widgets…’ From the widget chooser panel, scroll to KDE Connect or type ‘connect’ in the search box. Once you get to the widget icon, just double click and it should appear in the panel you’re choose to set. In this mode you can also reposition it at your will. Hi Eric, thanks for compiling the new releases. I especially like that I can now use more online services on Marble than before. The one problem was that Kajongg failed to install an executable even with zope-interface and python-twisted installed. However, I was able to get Kajongg to install properly and run by building from source, after all the dependencies were installed. since I had tried these ways already and didn’t find the connect widget or program I will now see if I am missing a package in KDE. This is pretty well possible since I upgraded with slackpkg+ from the Ktown repository and didn’t read the README because it normally works fine (-: . However it might does not work for new packages added to KDE. I will keep you posted. I had some issues with file browsing plugin of KDE Connect and contacted its developer, Albert (a very responsive guy I should say), and it point that maybe the kio slave is not packaged on your ktown distribution and this could be related to the issue. As I said there, I’ve searched ktown latest repository for current branch and I’ve found no mention about a kio package there besides audiocd, kdesdk-kioslaves and kio-mtp. I asked him to point me out where we can find sources for this kio. As soon as he reply, should I let you know so you can include it to ktown? I’ve tried to recompile the entire KDE Connect from the sources, but I’ve out of lucky here. Do you mind to recompile it with the latest sources to include the kio slave and update it on ktown? The “slackpkg install ktown” command will install every package in that “ktown” repository which you did not yet install. That includes all the kdei packages (language packs) so you will have to de-select those if you don’t want them. I had to manually install the new kde packages. It seems that slackpkg+ does not do this automatically which is good. Slackpkg+ seems to upgrade only packages which are already installed on your system and I really like this. After manually upgrading the missing KDE packages I have the KDE connect widget but it does not work with my Galaxy SIII together with my wireless settings. I will now wait for Eric’s response to Deny’s comments. Thanks guys. I really appreciate the friendly communication here. Deny, I will have a look at the missing kdeconnect:// kioslave this weekend. Thank you very much, Eric! I managed to compile it from source, although I couldn’t managed to install yet in the proper way. Anyway, your packages are greatly appreciated! Sorry Eric. I didn’t read your response before I replied )-: ! However, I downloaded all your KDE packages and installed all new packages (upgradepkg –install-new x86_64/deps/*.t?z and upgradepkg –install-new x86_64/kde/*.t?z). That resolved the issue for me without installing the kdei packages. Again thanks for all the help one receives here. That is one thing other Linux repos can not and maybe never will be able to provide. It is us and even more you (the experienced Slackers) provide. Thanks. I hope that I can provide some help as well now and then. Eric, just to let you know that I managed to install kdeconnect-kde that I compiled myself from the latest git repo commit (3fff0a33 at this time) and the kio slave missing for kdeconnect:// protocol works for me. There are still a crash on kwin when activating the underlying fuse/sshfs, but after kwin recovers itself, all works fine and I can see ‘All Files’ and ‘Camera pictures’ directories after click on the device icon in the Dolphin’s location bar. In the “stable” 0.5 tarball, the kio directory had been commented out, and that was why it was not compiled. I have downloaded the latest update to the “0.5” tag in the repository where they re-enabled the kioslave again, together with some other fixes. I’ll see what that brings. Well actually they did not even enable the kioslave in that update… I should perhaps just bite the bullet and use the latest git snapshot. I tried compiling libkfbapi and libkgapi which are available in the KDE sources and adds Facebook and Google integration abilities to KDE. However after installing them it doesn’t seem to have added them..
Is there something else that I am missing or doing wrong? I can not tell you. I did not add those as packages, so I have no idea what their effect will be. I built a newer version of kdeconnect-kde with the kioslave enabled. But indeed it crashes the KDE desktop the first time you try to open an Android device’s filesystem browser. Which is ugly and I understand why the developers disabled this for Kubuntu 14.04. The second time, I get a report that my Android device can not be reached… probably because it is running an old Android version (2.3). I am in doubt whether I should release this new package, because of the bad way it crashes your desktop. Yeah. I feel your pain. For a public release, I stick on your side and don’t release a package with this behavior. Although I have managed to compile, install and run this unstable version here, others out there could get pretty scared when they KWin get vanished for a while (which makes me remember how Windows Explorer crashes). I think it would be nice from our side to just wait for the KDE Connect devs to fix this issue and them release a clean, non crashing package. Such a great project and the quality of your own work just don’t need this scratch. I forgot to mention that there are issues with Android 2.3 and even 4.3. Mine is 4.4 (CyanogenMod 11), so it works just fine. KDE Connect devs are working on that too. Thanks Eric.. I’ll take a look into it. Hey mrgoblin… you don’t have to tell _me_ that it’s called a cashew 🙂 It was Deny who did not know. just recompiled kdepim-runtime and it’s worked. It detected the libraries and I can now integrate my Google and Facebook accounts into KDE. Hi Eric, just to close the topic relatively to corrupted kdm, I ‘ve tried to compile source on my notebook but removing old version before. Well it seems that it worked, now environment loads correctly. Solarized themes in latest konsole doens’t show directory colors, others themes do. I wasn’t the case with 4.11.4. It would be nice to hear some advice how to get usb device auto-mount back – after upgrade to 4.12.3 from 4.11.5 I have to manually choose what to do with the attached device. The fact that devices now are mounting under /run/media/user I already found. Yes, the new mount location is /run/media/$USERNAME which allows for better data privacy when more people than just one are working on the same computer. 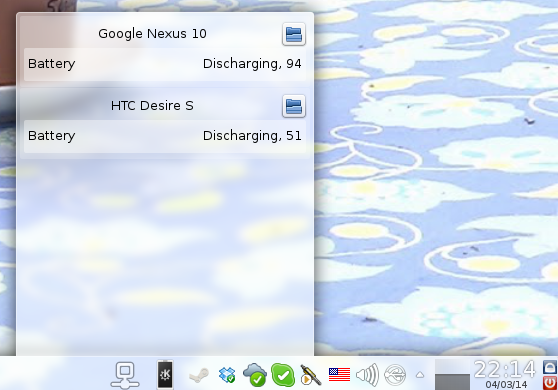 As for automounting removable storage devices in KDE, that is a feature I always turn off as fast as I can, whenever I find it enabled… but if you want it enabled, just go into the “Device Notifier Settings” by right-clicking on its icon in the system tray, and then look at the item “Removable Devices”. You will find the checkbox to “Enable automatic mounting of removable media”, along with a set of more specific tuning parameters. Is a KDE bug , i can reproduce in kubuntu , slack , and other distros. kde 4.10.X or minor woks perfectly , is not compilation problem , is not slackware problem … ITS KDE PROBLEM. As i can say i can reproduce this , in other distros, like kubuntu. When recompile a kernel and disable “SMP” , the bug dissapears. Those bug report have been closed with a fix for KDE 4.4. Perhaps you should create a new KDE bug report yourself. Thank you Alienbob, just upgraded 14.1 x86_64 no problems at all. Can’t connect to KDE Connect v.0.7.3.4 Android app any more. Anybody have it working? Eric, could you update kdeconnect-kde package – maybe, that is the reason? I have KDE Connect 0.7.3.4 on my Android phone and it is currently talking to the Slackware-current box with kdeconnect-kde 0.7.3. Are you on an older version of KDE and/or an older version of kdeconnect-kde? I am running KDE 4.14.3. The kdeconnect-kde 0.7.3 is the most recent version available. Hi Eric, sorry – I missed your message. I also running KDE 4.14.3 with kdeconnect-kde 0.7.3, but on Slackware 14.1. Can’t see any device not in kdeconnect desktop widget nor in the Android app. It worked earlier though. Odd.. Maybe I should test it on clean install on Virtual machine..
looks like ‘kdeconnectd’ daemon was not started. When I start it manually, kdeconnect works OK. Any thoughts why the daemon not starts automatically? You upgraded your computer five weeks ago? You did not tell that at first; you only stated that you could not connect to your phone anymore. Did you upgrade without exiting your X session? Anyway, good to hear that you found your error. Next update of my Plasma5 packages, it will have a new kdeconnect package.